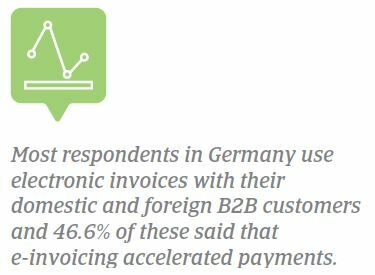 60.4% of German respondents said that their businesses have been impacted by overdue B2B invoices over the past 12 months. 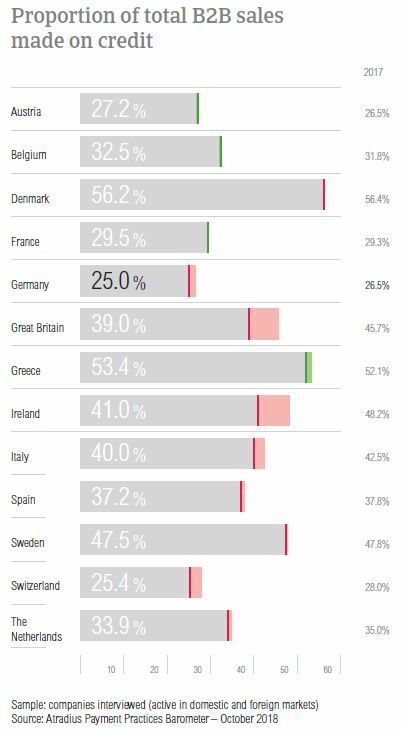 Of the Western European countries surveyed, Germany also had the second highest percentage of respondents (24.7%) who reported that late payments caused revenue loss. 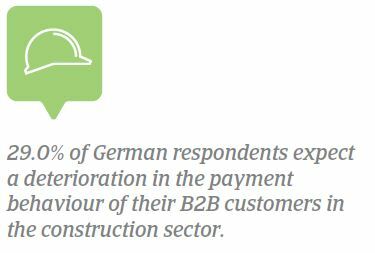 Insufficient availability of funds, buyers using outstanding invoices as a form of financing and the complexity of the payment procedure remain the top reasons for payment delays by B2B customers in Germany. The proportion of total B2B sales made on credit in Germany decreased slightly from 26.5% in 2017 to 25.0% this year. This is far below the regional average of 37.4% and the lowest proportion of total B2B sales on credit made in Western Europe. German respondents seem slightly more inclined to offer credit terms to their domestic B2B customers than to their B2B customers abroad (25.9% versus 24.1% respectively). When asked why they use trade credit, respondents in Germany mentioned the same reasons for selling on credit to their domestic and foreign B2B customers: credit sales are perceived as a way to expand business domestically and internationally and they are important for maintaining current business relationships and to developing new ones. We grant trade credit to get as many customers as possible, to build a solid customer base and to bind these customers to our company. 41.3% of German respondents would refuse to grant credit terms to their domestic B2B customers, if the buyer has exhibited poor payment behaviour and 19.6% if the financial situation of the customer is weak. The customer’s poor payment behaviour was also the top reason why respondents would refrain from offering credit terms to B2B customers abroad (mentioned by 38.1%). The second most frequently mentioned reason for not selling on credit to B2B customers abroad is high economic or political risk in the customer’s country (26.2% of respondents cited this). Credit sales are opening up new markets for us and help us gain more B2B customers abroad. The percentage of respondents who reported late payments by B2B customers dropped three percentage points in 2018. However, at 89.5%, this is still slightly above the regional average. Payment delays were reported to occur almost as often from domestic B2B customers and foreign B2B customers. In 2018, the proportion of past due B2B invoices in Germany remained stable at 40.5%. This is slightly below the average for Western Europe overall. Past due B2B invoices by foreign customers were reported slightly more often than those by domestic customers. In 2018, the average Days Sales Outstanding (DSO) figure recorded in Germany is 27 days, showing an increase of two days compared to 2017. When asked about the expected DSO trend over the next 12 months, 67.8% of respondents in Germany said that they do not foresee any changes. Of the ones that expect changes, 19.0% anticipate an increase and 13.1% a decrease. Historically, suppliers in Germany have given their B2B customers some of the shortest payment terms in the region. This holds true in 2018. Moreover, respondents here reported further decreases. Domestic B2B customers had, on average, 20 days to settle invoices (two days less than in 2017) while foreign B2B customers, 23 days (three days fewer than in 2017). 51.4% of respondents in Germany stated that they are not likely to differentiate payment terms between domestic and foreign B2B customers. Of those who differentiate, 34.3% said that they are inclined to ask their domestic B2B customers to pay faster. 14.3% said that they are likely to give their domestic B2B customers more time to settle payments. The main reasons for differentiating payment terms in Germany are industry practices, internal policies, the economic situation in the export country and the financial risk related to the export transaction. In 2018, payment delays have also changed slightly. Compared to 2017, domestic payment delays decreased three days to 18 days, on average, while foreign B2B customers paid with a delays of 22 days, on average (2017 average 21 days). The decreases in payment terms and payment delays, resulted in a three day reduction in the average payment duration, which now stands at 42 days. Next to the Netherlands, Germany had the shortest payment duration in the region, which means that respondents here manage to convert B2B invoices into cash the fastest. 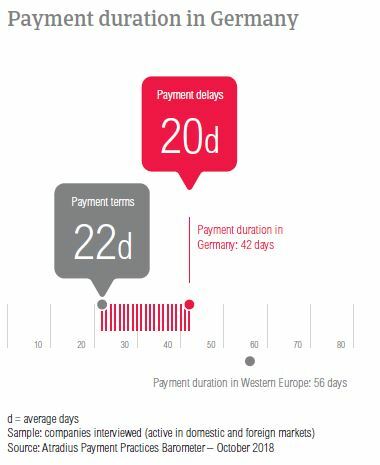 Domestic payment delays in Germany occurred mainly because of insufficient availability of funds (mentioned by 45.5% of respondents) and because of buyers using outstanding invoices as a form of financing (33.9%). Of the Western European countries surveyed, Germany also had a high percentage of respondents who stated incorrect information on invoice (22.3% versus 15.6% in 2017). 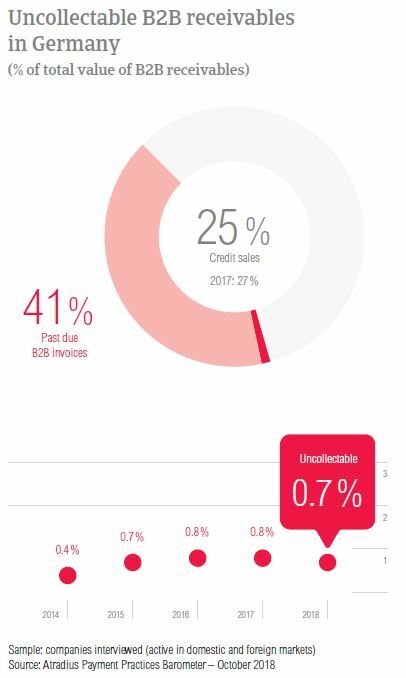 Payment delays from B2B customers abroad occurred most often because of insufficient availability of funds (37.9%), buyers using outstanding invoices as a form of financing and the complexity of the payment procedure (the latter two reasons were mentioned by 33.3% of respondents). Asked about the impact of overdue B2B invoices over the past 12 months, 24.7% of German respondents said that these led to revenue loss. This is the second highest percentage of respondents who reported this consequence in Western Europe after that of Greece, much higher than the regional average of 16.8%. Other repercussions mentioned frequently were the need to delay investment in property, plant and equipment (19.8%), the need to postpone payments to own suppliers (15.4%) and the need to pursue additional financing (14.3%). The majority of respondents in Germany (63.8%) said that they are using online invoicing with their domestic and foreign B2B customers. Another 13.3% want to make the move towards the online environment this year. In contrast, 21.0% said that they do not use e-invoicing and only 1.9% that they no longer use it. Asked about the effect of e-invoicing on payment duration, 46.6% of German respondents believe that electronic invoices accelerated payments. A slightly higher percentage, 48.9% said that they have not noticed a noteworthy effect. 4.5% reported that they experienced a slowdown in payment. German respondents have been asked to rank these risks from the most significant to the least significant: US protectionism turning into a trade war, Fed policy becoming misguided, a ‘hard landing’ by China and geopolitical risk. With the US as one of Germany’s main trading partners, most respondents said that US protectionism turning into a trade war is the most significant risk to global growth. With 54.7%, Germany had the second highest percentage of respondents in the region who stated this; much higher than the 44.8% registered in Western Europe overall. 21.7% of German respondents said that US protectionism is indeed a significant risk but it may not be the most significant one. Misguided Fed policy was seen as the second most significant risk (20.7% of German respondents opted for this). 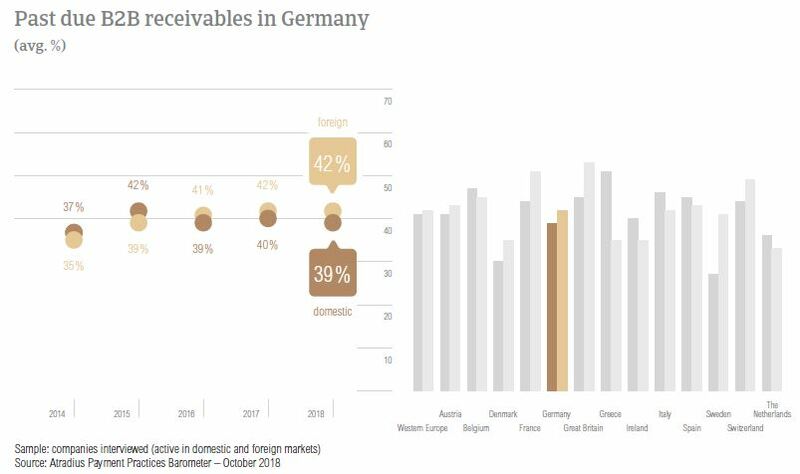 In 2018, the average proportion of uncollectable receivables in Germany remained stable at 0.7% (0.8% in 2017). Similarly to what was observed in the past, domestic B2B receivables were written off significantly more often than foreign B2B receivables. Uncollectable receivables originated most often from B2B customers in these industries: chemicals, construction, consumer durables, machines, business services and services. A common problem in the entire region – the customer going bankrupt or out of business – was also the main reason for write-offs in Germany (mentioned by 69.9% of respondents). This is the highest percentage of respondents in the region and an increase compared to 2017, when it stood at 63.7%. The second most frequently reported reason for write-offs is the failure of collection attempts, mentioned by 33.1% of respondents. As mentioned before, in 2018, the average payment term given by German respondents is 22 days. However, payment terms vary by sector. As such, B2B customers in the paper and metals sectors enjoyed longer average payment terms (36 days and 27 days respectively). In contrast, B2B customers in the construction materials sector are being asked to pay much faster (on average, within 12 days). Similarly to what was observed in 2017, B2B customers in the construction sector generated some of the longest payment delays. B2B customers in this sector, paid on average 16 days after the due date. The main reasons are similar to those stated for the country overall: insufficient availability of funds and buyers using outstanding invoices as a form of financing (reported by 52.0% and 48.0%). Looking at the coming 12 months, 62.0% of the survey respondents said that they do not foresee changes in the payment behaviour of their B2B customers in the construction sector. 26.0% said that there might be a slight deterioration and only 3.0% expect significant deterioration. The global economy is in an upswing based on broad-based economic growth and still-low interest rates, but we are reaching a turning point. Having drawn from the expertise of Atradius Collections' local offices, the International Debt Collections Handbook explains the different regulations and procedures for debt collections in Germany.